The Gmail app for Android has been one of the most popular and best Email clients for Android phones, and the Google team has been sending updates with some best changes and performance improvements, but this time, the update has brought options to make the usage of the app far easier than earlier. The update is sent for the various Android versions, which includes the Android 2.2 and above, Android 4.0 ICS and above, Android 4.1 JB and above. The best part of this update is that the users can directly delete or archive or reply to a mail that has just arrived in the notification panel, and this all can be done from the notifications section rather than going to the app. The Android 2.2 and later version would have the new Labels API, advantageous for the 3rd party app developers. Apart from that, there have been a lot of performance improvements done. 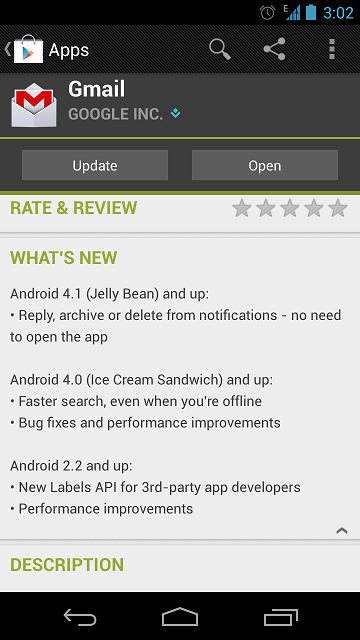 Android 4.0 Ice Cream Sandwich and later will provide a faster searching of the mails and allows for searching the mails even when the device is offline. The app update comes with bug fixes and performance improvements too. 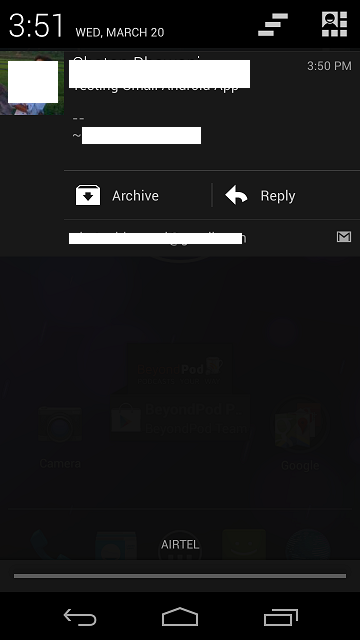 Android 4.1 Jelly Bean devices would see the update with the options to send replies, delete or archive mails directly from the notification section. Another noticeable change is the font of the header title of the mail which looks clear and better to read than in the previous version, and this change is seen in all the versions of Android. Gmail had sent an update a few months back when swyping the mails to the right or left in the app did the job of deleting and archiving the mail, but now with this update, the job gets easier and one wouldn’t need to go to the app all the time for every mail they receive. WTF?!?! Everywhere I’m reading it says you can reply, archive, or delete from the notification pull down bar…BUT THE OPTION TO DELETE IS NOT THERE!! it’s just NOT!! It’s even missing from your screenshot and yet you DIDN’T SAY ANYTHING ABOUT IT!?! Archive and reply are the only options, how the hell do you delete it without opening it?